Much has been written on how to create an effective working team, but the dynamics are many and nuanced. Is it even important to have a team per se or is a strong work group sufficient for strong results? It depends on many factors, but for a leader, having a strong, aligned team is often the difference between mediocre execution and breakthrough results. It starts with the teams’ leader and his/her vision and team expectations and accountabilities—it all begins with leadership. 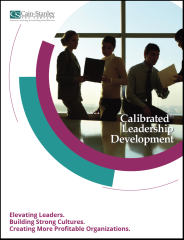 Along with providing clarity and performance standards, the leader must provide strong rewards and recognition, commitment to the team, and provide individual flexibility to make decisions, and more. First the leader needs to set up the environment for success. Once the environment is created, it is important to look at the individuals and their commitment to the team goals and, of course, their ability to perform. None of this is easy—if only a team building exercise could make everyone work together seamlessly and create the desired outcomes every time! So, to help the leader, we evaluate the elements that exist today, help the leader create a vision for the future (outcomes and process), and then create plans and support systems to make it happen.